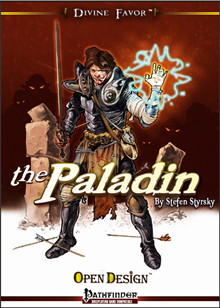 Designed by Stefen Styrsky and developed by Sigfried Trent and Wolfgang Baur, Divine Favor: the Paladin gives an in-depth exploration of the paladin class and useful advice on making the most of it. How to deliver a truly earth-shaking smite! Pick up Divine Favor: the Paladin and start smiting! And check out the Advanced Feats series to expand the other Pathfinder character classes.